Home / news / Pregnant Women in Kenya Eat What? Pregnant Women in Kenya Eat What? In Kenya, it is not unusual to see pregnant women satisfying a curious craving by eating stones. Extracted from quarries and traditionally sold at roadside stalls, the stones, known locally as odowa, are now finding their way into mainstream markets, despite the better advice of doctors. Joyce Navtutu, a 29-year-old mother of two says she could not resist the odowa craving during both of her pregnancies. All of a sudden, she says, she was overcome by a natural craving to eat stones. “While I was pregnant, especially this last pregnancy, there is a time I just woke up and felt, ‘Let me try this,'" she said, explaing that the smell of the stones is what compelled her to eat them. "I started eating and eating, and then I could not stop," she said. The craving and eating of nonfood items such as clay, dirt, or sand is quite common among pregnant women in Kenya. Odowa stones are being packaged and sold mostly to be eaten by pregnant women in Kenya (R. Ombuor/VOA). Sold at roadsides, in small markets and shopping malls in urban centers, the edible, marble-sized stones have spread to many towns. 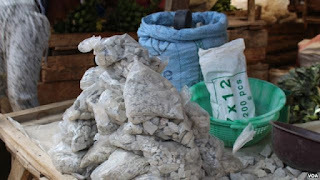 According to Leah Adhiambo, a broker in the trade who supplies stones to high-end supermarkets, the habit has become increasingly popular and stores have warmed up to the idea of stocking it. Adhiambo is quick to point our that the stones are becoming a profitable product. “We stock the shelves almost every week, which means that the stones are selling,” she said. Experts say odowa cravings are the result of vital mineral deficiences. “During pregnancy there is depletion of calcium and a lot of minerals in the body due to the demand," said Dr. Jane Mwangi of the Nairobi-based Miliki Afya clinic. "So I think they go for those stones because to some extent they contain those minerals. So most of the times they go to look for those minerals in the stones instead of coming to the hospitals to be given the supplements they need." Mwangi says the stones can also potentially cause infections and other problems. Recent research by the African Council for the Gifted and Talented (ACFGT) also suggests that eating stones during pregnancy can affect children’s health and their ability to learn. So while the trend may become increasingly popular, according to doctors, the benefits don't outweigh the risks.